Decisiveness is a struggle that many of us suffer from. It can be especially difficult when we want to put in serious thought and not make a rash or off the cuff decision. Sorting out all of the options and trying to evaluate which is best can quickly backfire and become frustrating and overwhelming which ultimately prevents us from making a decision at all. We just throw that puppy on the back burner and worry about it another day while we suffer from Paralysis by Analysis. How many of you are there right now? Just standing at the starting line and pacing back and forth but cannot for the life of you make that first step across the line? Do you have a project or goal, dream or desire, that you have been meaning to get to but can’t seem to do so because there is no way you could handle “F’ing it up (the “F” standing for Failure of course)? You want it to be perfect, and until you figure out how perfection is going to happen, then there is no way you are going to start working on it, it’s pointless! That little beauty is what we Coaches refer to as a Gremlin, and this one in particular is known as perfectionism? Did you gasp, “Who me? I AM NOT a perfectionist!”. Or did you just shake your head and chuckle, you’re well aware this is your Gremlin? Trust me there are plenty of Gremlins to choose from, and coaching is a great resource to fight them off. As for this one, no one wants to, nor should be, labeled as a “perfectionist”, but the reality is, we all suffer from it in more ways than we realize and it causes some serious detriment to our lives when it decides to show up. Take a look at how you currently go about making the big decisions in your life, or even the little ones? I love the saying and am a true believer that How you do one thing is how you do EVERYTHING. When you really think about it, we all have patterns in our behavior that guide us without us even being conscious of it, we just click on the autopilot button and carry on day to day while our Ego makes decisions all day long without consulting our head or our heart. It just ticks off those decisions based on learned behavior, programmed thoughts and the limiting beliefs that we have picked up along the way. Even though these are usually false, we accept them as truths and usually beat ourselves up about it. Some other things you may be doing is asking yourself “what is the logical thing to do?” or the “safe” thing to do. We try and evaluate the risk and return on investment, as if you are an insurance underwriter with mathematical equations and formulas to figure how this decision could potentially blow up in your face and what the bottom line cost of that decision could be. I mean really, who has the time or the wherewithal for all of that analyzing and pressure?! And how could you make a good decision with all of that going on? That is why tapping into what we call Holographic reasoning or our True Self – evaluating with your intellect, emotion and intuition, and not allowing one to take precedence over the other, will ultimately allow you to connect with your authentic self and make a decision that feels right and you will be confident about. The key is identifying whether you are choosing from Fear or Love, based on the evaluation of your True self, because you can’t have both. Fear and Love are one in the same, it’s just a difference of how they are expressed and the emotions you feel from them. That may sound strange, but it can be that simple, rather than a positive and negative, it’s love or fear. Fear is very tricky and it disguises itself as “logic” or “reality” when really it isn’t either of those things, rather it is the ego looking for self-preservation at all costs, rather than growth, which frankly is not always a comfortable thing, and when it’s big growth it definitely isn’t comfortable! But growth is what life’s all about, without it your dead (either physically or figuratively), and it’s what makes the journey so good. So, how do you take all this junk your Ego is creating and put it aside to make a wholehearted decision? It starts with one word – AWARENESS! In order to gain some awareness around the things that are preventing you from feeling decisive and a learn how to move past them so that you are able to not only make a decision, but make one that you feel at peace with, empowered and confident to move forward with. To start, take 5-10 minutes to purge all of those crazy thoughts and feelings you are having around making the decision – right them down, type them, dictate into your phone, whatever is easiest for you and just go for it without judgement. Just note any thoughts and feelings you have around the decision you are trying to make i.e. Are you feeling anxious, excitement, nervousness, what is your motivation, what makes you excited or happy about it, What worries or concerns you, Why do you want it or don’t want to do it, etc. Now, take some time to really envision what your ideal world looks like, what do you really value in life, and get specific. For example, initially you may say “I want to make a lot of money” – but get more specific with what you are really looking for and what you would do with all that money. Dig deeper, for example “I really want to take my family on vacation and make some great memories together relaxing and playing on the beach.” The more specific the better but at the same time don’t put too much pressure on yourself and take as little or as much time around this as you are able, keep in mind though the more time you spend focusing on this the more effective this is likely going to be. Don’t let the timeframe be an excuse for not doing it, do what you can! Next, compare the two; how does your list of thoughts and feelings line up with what you envisioned for your ideal world? Are the items on that list based out of fear or love for what you truly desire (Star the feelings that come from love (tend to have a more positive tone), ask how the decision really effects your ideal world (How important is this decision really?) When you envision each of the options how do they play out in that ideal world? Do they even show up? If they do, what does it look like when all is well in the world. 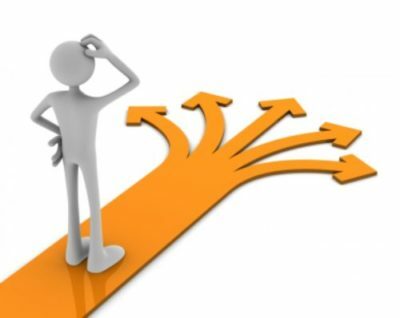 Find the option that fits best with the specifics of your ideal world, and Go for it! That is ultimately what you want right, so how does it serve you to value items on your pro’s and con’s list that do not ultimately serve that vision? Most importantly remember you cannot control the outcome, you can only make the choice, and enjoy the ride. By making the choice and moving forward you prevent paralysis by analysis and fear to override, rather you get to grow through experience rather than sitting in stagnation. Have faith that no matter what you choose, it is the right choice for that moment in your life. It may lead to some troubled waters, but that is what you need at that time, to overcome difficulty, learn from it and move on. It’s ok to not have it all figured out, that is half the fun of this game called life. Or it might be the most amazing experience of your life, and just think you would have missed it because you stood on the ledge never willing to fly because you were too afraid to fall. Whether it is a big decision or a little decision, get back to basics of who you are, don’t worry about all of the external stuff, it’s just noise distracting you from making the decision and stepping over that starting line. If you are interested in learning more about how to improve your decisiveness or more about coaching and how it can help you in other areas of your life, please contact me for a Free Complimentary session by clicking here. ← Faith is More Powerful than Proof! Wow that has me thinking! !